This Toronto based publishing company was founded in 1939 under the name Commercial Signs of Canada by Gene and Cy Bell. They began publishing Canadian comic books in 1941, when the War Measures act limited the importation of luxury goods (including comic books) into the country. These publications were black and white, with full colour on the cover only leading to the term "Canadian Whites" being used to describe Canadian war-era comics. Located on York Street, the company published bi-monthly variety comics with Canadian characters and stories written and illustrated by Canadian authors and artists. Titles included "Active Comics", "Commando Comics", "Dime Comics", "The Funny Comics", "Wow Comics", "Joke Comics", and "Triumph Comics". 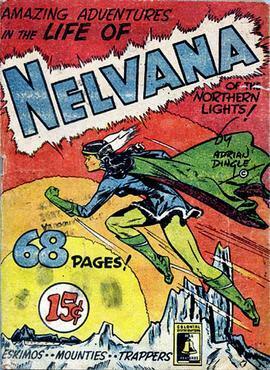 Commercial Signs changed its name to Bell Features and Publishing Company in 1942, when Adrian Dingle and his Hillborough Studios joined the company, brining with it the Triumph-Adventure comic and the first Canadian female superhero, Nelvana of the Northern Lights. When trade restrictions ended in 1945, and American comic books returned to the Canadian market, the company faced difficult competition and circulation dropped. The company eventually closed in 1953. Donated to Ryerson University Library and Archives from a private donor in 2014. Comics), and Commando Comics, soon followed. When WECA was repealed in June of 1944 and American comic books were once again available to Canadians, Bell Features attempted to remain competitive by expanding their market into the US and the UK, and by publishing some titles in colour. Due to a lack of available newsprint, however, the company shifted its focus on Canadian content and began reprinting American titles. Bell Features, CanCon, and the Perception of Comics in Postwar Canada. Presentation for SHARP Montreal. Individual comic books in the collection are catalogued in the Ryerson University Library catalogue. They can be found by doing a keyword search "Canadian Whites".